It was a deal that former Sears Holdings Corp. CEO Alan Lacy once thought could save the former retail Goliath. But now, about 13 years after the department store merged with discount retailer Kmart, Lacy says the deal’s failure to turn around Sears – combined with the financial crisis – served as the final “nail in the coffin” for the 125-year-old retailer. Lacy says Sears was not immune to the 50 years of decline in the U.S. department store industry. “You think about all the department stores that used to exist, and how very few exist today. Yes, Sears is the most current casualty, but there’s others to follow… It’s not over with,” Lacy said in a phone interview with BNN Bloomberg earlier this week. In 2005, hedge fund manager Edward Lampert led one of the biggest retail mergers in history by using Kmart to buy Sears, Roebuck & Co. in a cash-and-stock deal valued at US$11 billion. Lacy, who was the CEO of Sears before the takeover, became the CEO of the combined companies, but departed from the top job six months later and became vice-chairman. Lampert, the majority shareholder and chairman, named Alywin Lewis the new CEO. Lacy left the company in 2006 and Lampert took over as chief executive in 2013. Lacy said the original plan behind the Kmart-Sears deal was to convert some of the 1,500 Kmart outlets into Sears stores to diversify the department store chain’s locations from just shopping malls where customer traffic was declining. Other motives for the deal were to acquire big brands under Kmart’s purview, including Martha Stewart’s line of household goods, as well as being a larger competitor in the retail sector, according to Lacy. “It was just better to be bigger given Walmart, Home Depot, etc. Those were the core principles of why we did it,” Lacy said. After the takeover, Lampert appeared focused on buying back as many shares of the company as possible as he was convinced Sears’ stock would rise extraordinarily, Lacy said. Using available cash for share buybacks crippled the retailer’s ability to market itself, he added. Sears Holdings spent US$5.8 billion buying back shares from 2005 to 2010. Additionally, in Lacy’s opinion, Lampert developed “more of an affinity” for the Kmart brand, and instead of converting Kmart stores to Sears, he put appliance departments in Kmart stores. “When you got a, largely speaking, less-affluent renter-oriented customer base, that was probably not the most powerful thing to do,” Lacy said. The Martha Stewart line of goods, one of the jewels of the merger, also never made it into Sears stores after the partnership between Kmart and the lifestyle brand fell apart in 2009. 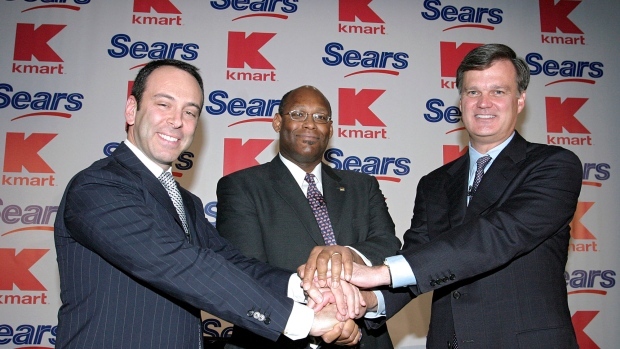 Then, about three years after Kmart bought Sears, the global financial crisis unfolded, and the U.S. housing market crash hit Sears’ business very hard, Lacy said. In a statement after Sears filed for bankruptcy in the U.S. on Monday, Lampert’s hedge fund ESL Investments said it invested time and money in Sears because it believes in the retailer’s future. “We will continue to press forward with the goal of seeing Sears emerge from this process positioned for success as a smaller, less indebted retailer in an integrated retail environment,” ESL Investments said.